The Perth International Jazz Festival (PIJF) makes its much anticipated return to the city for one weekend only from 29 – 31 May 2015. Presenting 52 incredible jazz performances across 19 exceptional venues in the heart of the city, the three day festival will feature a blend of ticketed and free community events, showcasing a host of celebrated local, national and international jazz artists. 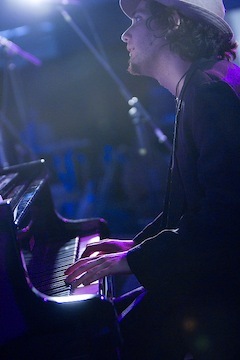 Highlights of the festival include Richard Bona (NYC), recognised as one of the planet’s revelations of the last decade; Grammy nominated pianist, keyboardist, composer and arranger, Barney McAll (NYC); Perth-born Parisian, revelled for her jazz and hip-hop style Rachel Claudio (Paris); award winning vocalist and songwriter, Tina Harrod (SYD) and leading Polish Jazz band, Artur Dutkiewics Trio (Poland). On May 31, PIJF will present ‘Jazz at the Cultural Centre’,with featured performances from the Festival’s headline artists including renowned jazz bassist Richard Bona (NYC) as well as range of international and homegrown talent. Ticketed performances will also play at Brookfield Place for ‘Jazz Quartet’, The Ellington Jazz Club, The George and Laneway Lounge. Numerous FREE events will be performed at Brookfield Place, State Theatre Centre Courtyard, Perth Cultural Centre’s Urban Orchard & PICA Stage, The Northbridge Piazza, Stables Bar, Creative Labs, The Terrace Hotel, The Moon and Forrest Place. 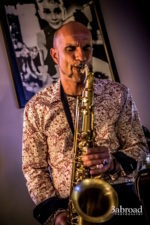 Jazz by the Bay will deliver the sounds of jazz in the beautiful settings of the South West. Just think, great food, the perfect place, cosy venues and three days of jazz with a touch of soul and funk. Where: 12 stunning venues throughout the areas of Dunsborough, Yallingup and Geographe Bay. Download the full Jazz By The Bay program (PDF). Free Jazz Workshops @ WAAPA! 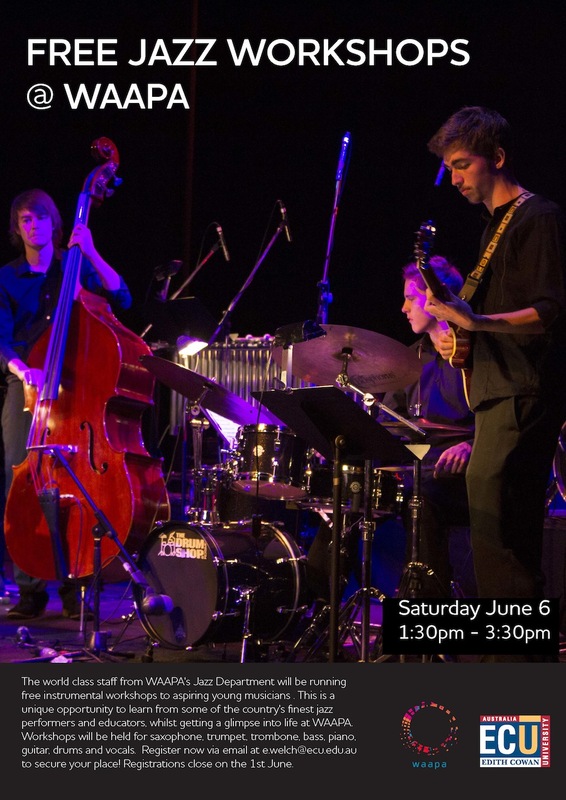 The world class staff from WAAPA’s Jazz Department will be running free instrumental workshops to aspiring young musicians on Saturday June the 6th from 1:30pm – 3:30pm. This is a unique opportunity to learn from some of the country’s finest jazz performers and educators, whilst getting a glimpse into life at WAAPA. Workshops will be held for saxophone, trumpet, trombone, bass, piano, guitar and vocals. Register now via email at e.welch@ecu.edu.au to secure your place! Registrations close on the 1st June. The 2015 JazzNOW! Jazz Camp is now open for online registrations. The centerpiece of the JazzNOW! program, Jazz Camp is tailored towards students aged 11-18 and runs from Monday July 6 to Friday July 10 at WAAPA in Mount Lawley. Students will also get information about auditioning for WAAPA and WAYJO, if that’s what they’re aspiring to, otherwise it is simply a fantastic opportunity to learn, play and have fun with jazz music and improvisation. Jazzcamp has been running annually since its inception in 2001 and many Jazzcamp alumni have gone on to graduate from the WAAPA jazz program and establish successful musical careers in Australia and around the world. For more information to and to register, visit the Jazz Camp website.